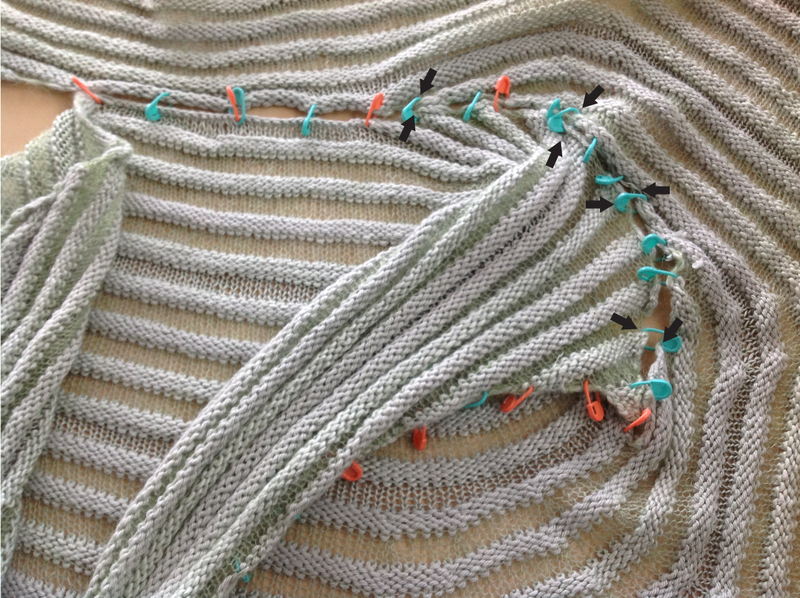 The knitting is done, ends are woven in, Swirl blocked, and now it is time to put it all together. If you're still unsure of how that funny shaped thing actually becomes a jacket, not to worry. It will make all make sense very soon. Find yourself a nice big flat working space and gather up the tools you'll need: a couple of packages of locking stitch markers, a tapestry needle, scissors and scissors and matching yarn. Let's get started. First, you will need to identify and mark two points: center back of neck and the center of the inner collar edge. 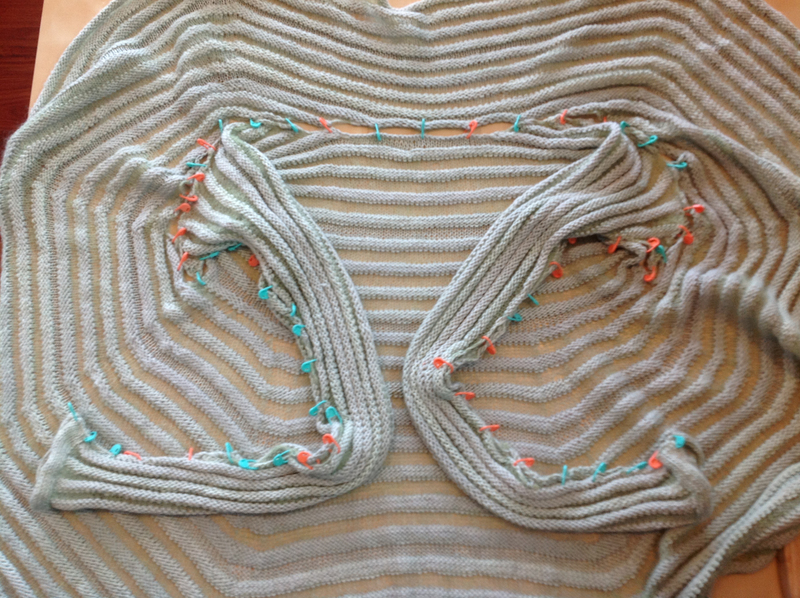 To find these points, I often start by folding the Swirl in half down the center back. 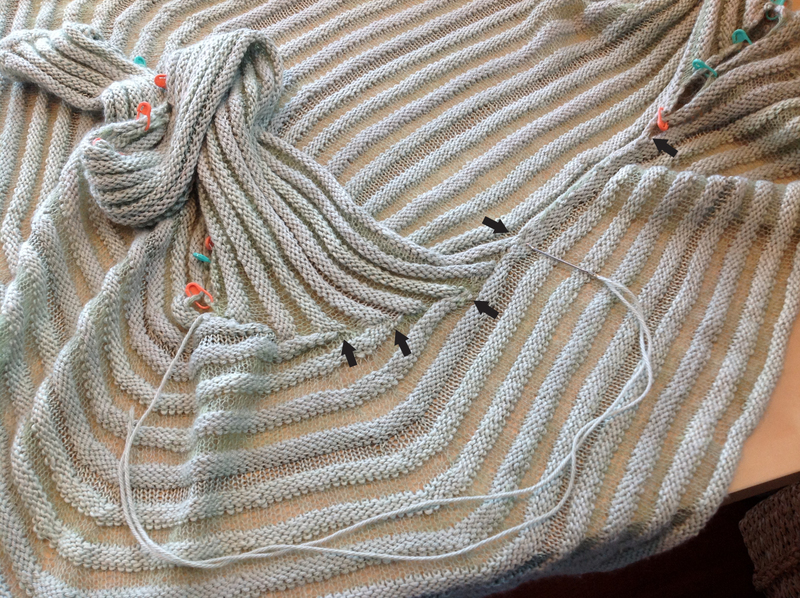 I check carefully to see that I've matched up landmarks like decrease points, beginning and end of neck bind-off, etc., and then use locking stitch markers to mark my points. If you look carefully, you can see a turquoise marker at center back of neck and an orange maker at center inner collar edge. Now spread your Swirl out flat with "right side" up. Pin center back of neck to center inner collar edge. Pin cuffs together at cuff edge and then at top of cuff trim, if there is any. 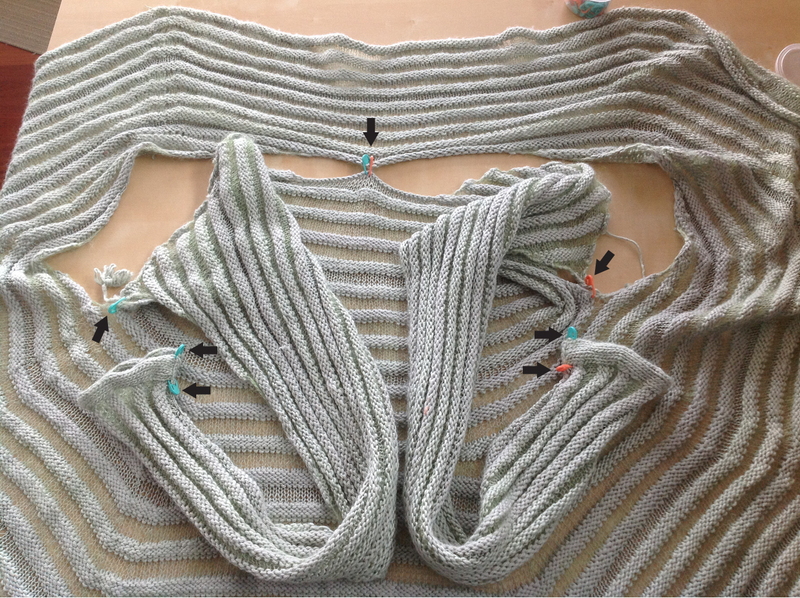 Next identify the V-shaped notches (lower arrow) formed on each side of the back bodice when you began adding stitches to create the sleeves . 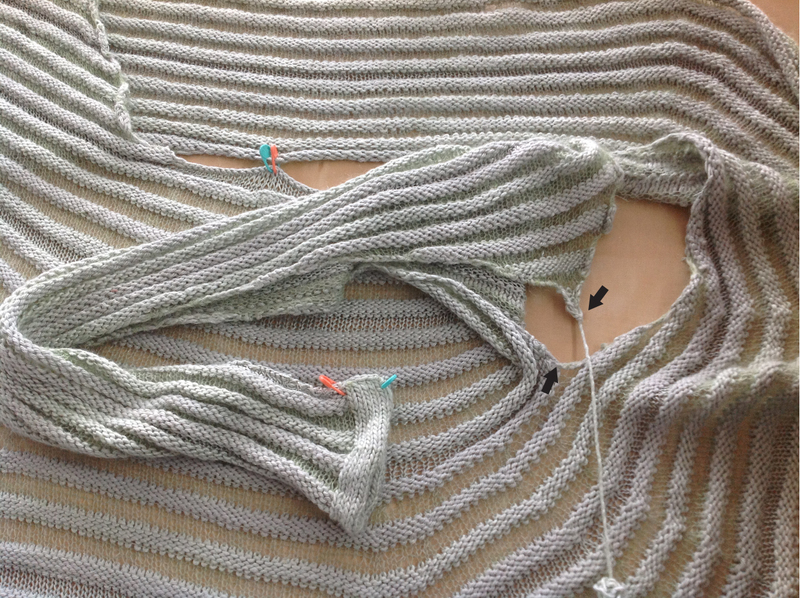 Now locate the tips of the front bodice on each side (upper arrow). Next pin outside edges of back of neck to inner collar edge. When you've got it all well pinned, it is time to sew! 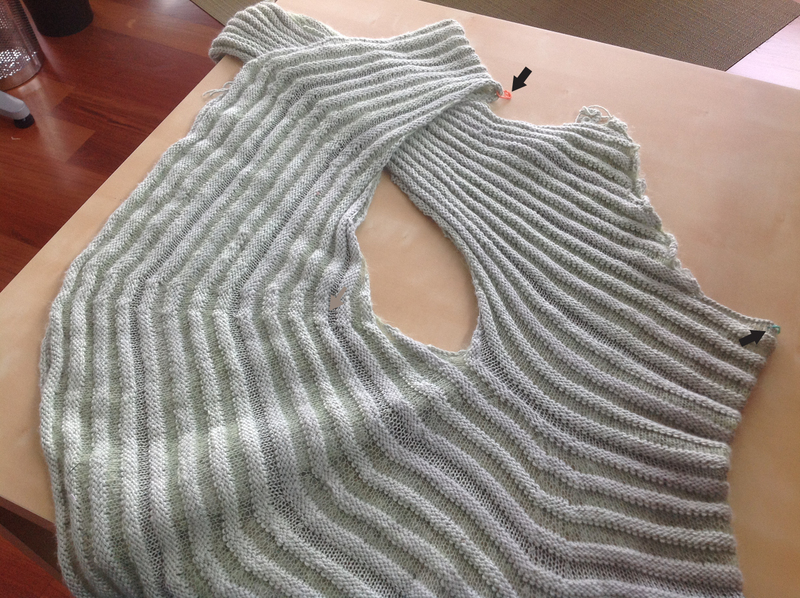 I start by sewing the back neck seam. If I'm sewing up a Swirl with a collar deep enough to be worn as a hood, then I put the public side of the seam on the outside, so when the hood is up you see a nice finished seam. 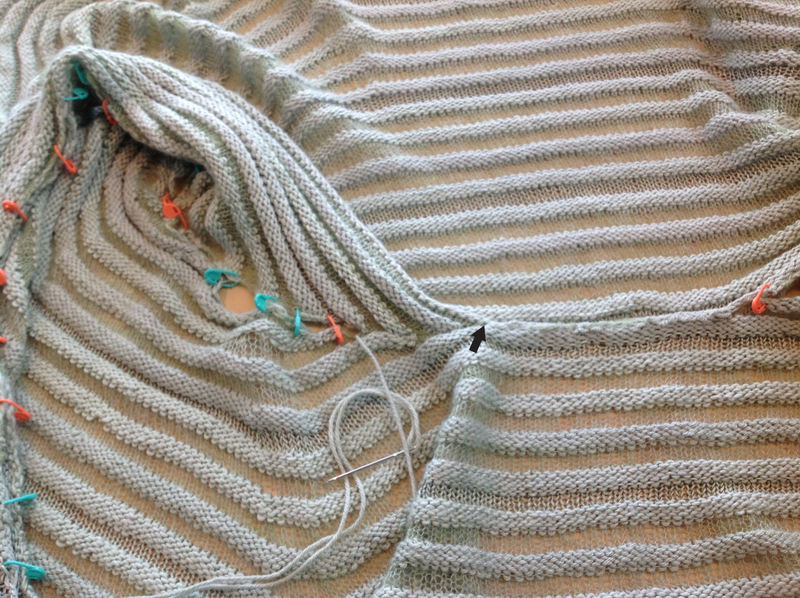 If the Swirl collar cannot be worn as a hood, I like to put the finished seam on the inside. Decide which side your neck seam will be on and arrange your Swirl so that the side you want the finished seam to show on is up. 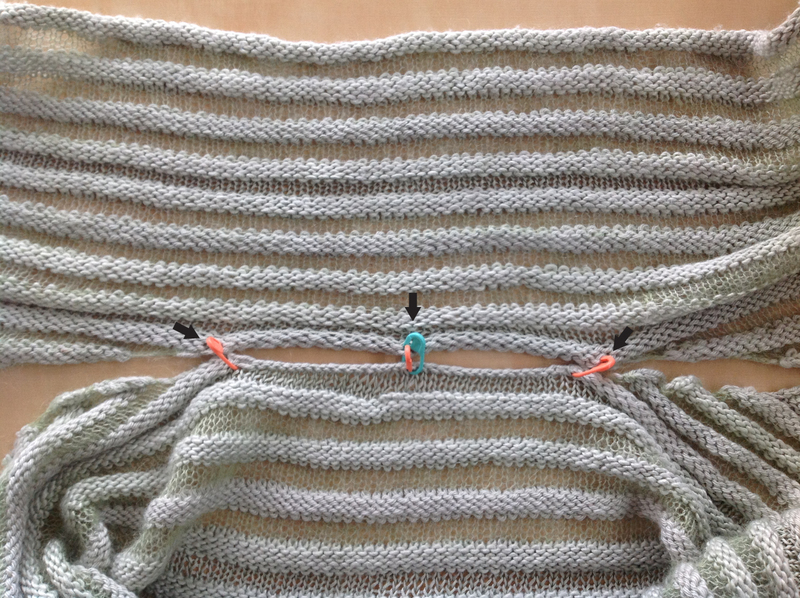 Seam that section using matching yarn and mattress stitch. 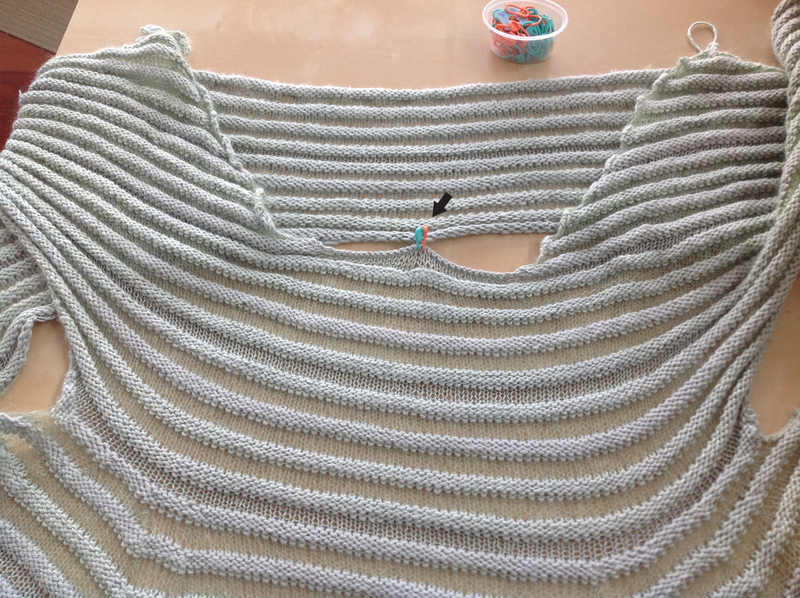 As you can see I chose to put the finished neck seam on the inside, so once that portion of the seam is completed, I turn the whole Swirl over and, at the point where you see the black arrow, I bring the yarn through so that I can continue the finished seam on the outside of the garment. Here you see the seam as it continues around the front of sleeve. Two arrows at back neck edge show the unfinished side of the seam there; next three arrows in center of photo point to places where welt edges converge. Continue seam to cuff. 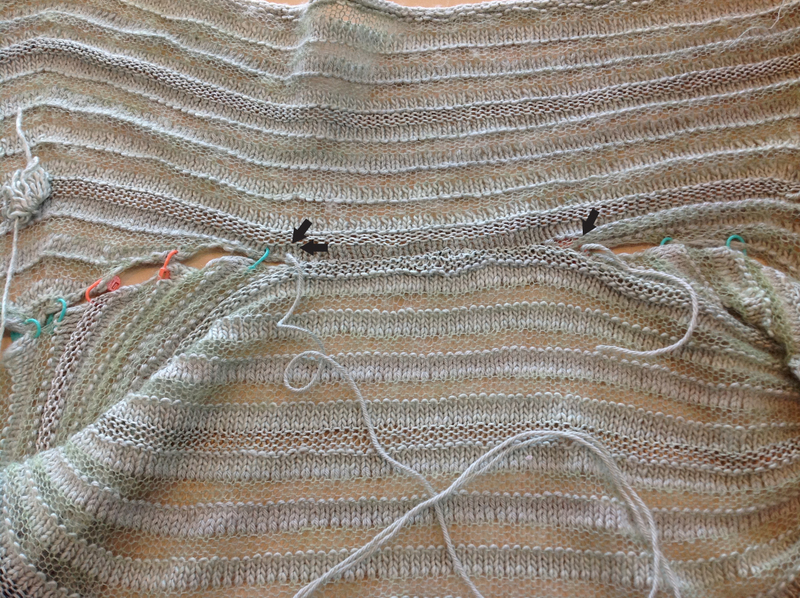 Then pickup seam at opposite neck edge and complete seam on opposite sleeve. Congratulations--you're done! You'll have to hunt to find that seam once it's all sewn up--this is about as much as you'll see other than an occasional glimpse of the seam as it runs down the sleeve. Your newly completed Swirl will benefit from hanging on a dress form, or over the back of a straight backed upholstered chair, or simply being worn. 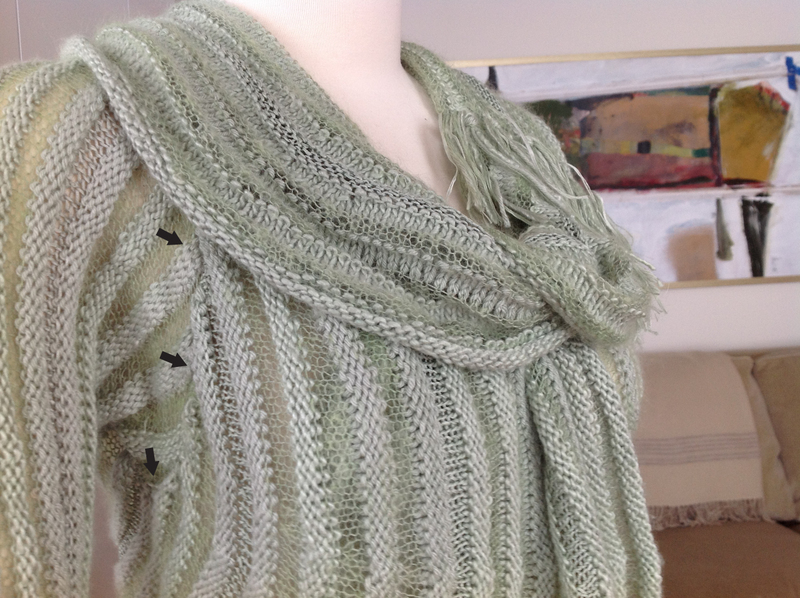 Gravity will give your Swirl a final touch, adding drape and adjusting shape.. If your yarn is very resilient and your Swirl has a bit of a Michelin Man look to it, a light steaming while on the dress form or chair back will help.